Soak up the peace and tranquillity of this beautiful farm. Papkuilsfontein, on top of a lovely plateau, nestled between the West Coast, Hantam and Namaqualand, in the Northern Cape. Three stone cottages, each in its own private fynbos setting, are sensitively restored to maintain its historical charm and furnished in keeping with the rich history of the farm, looking after your every comfort. View the awesome canyon and its 100 m waterfall. Experience the rich bird life, fauna, and San rock art. Swim in the cool waters of a natural rock pool, or in the pool at the cottages, built to be reminiscent of a farm dam. Hike the trails through sandstone rock formations and don’t forget to bring your mountain bike. Enjoy the world-renowned flowers in this Serengeti of the floral kingdom in spring (this area is known as ‘‘the Bulb Capital of the World’’ as it has the highest specification of indigenous bulbous flowers on Earth). 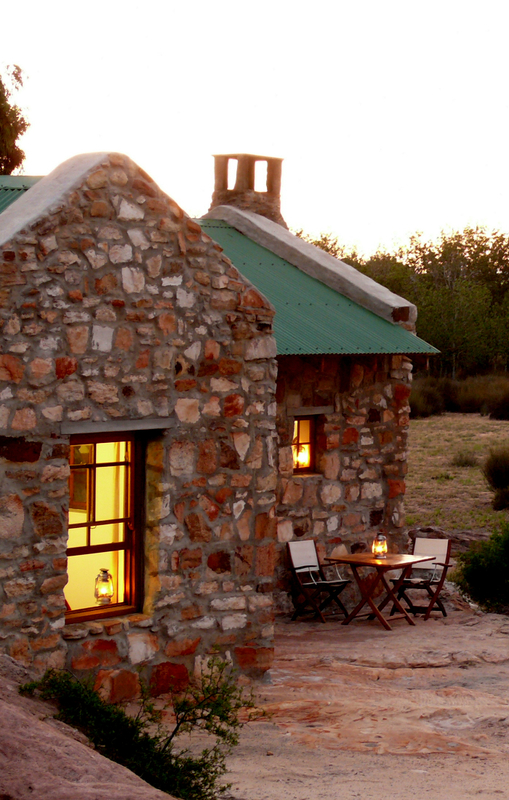 De Lande offers the same AA Highly Recommended award as the Papkuilsfontein cottages. The generous proportions of this typical Karoo style farmhouse can accommodate eight people with ease and comfort in four en-suite rooms. Sip your sherry around the fireplace, or enjoy the cool evenings on the stoep before sitting down to our sumptuous three course dinners. Out of season De Lande can be hired as a self-catering house.